There is nothing like the power of collaboration in making measurable, positive, and sustainable impact on the welfare of the communities in which we live and work. Junior League of Long Beach is an all-volunteer led organization that has been serving the community for over 85 years. Last year alone, our membership provided more than 2,000 hours of direct service volunteer support to institutions and initiatives that make the Long Beach community a healthier, more vital place to live. Working hand in hand with community partners, our issues-based model focuses on efforts to address self-esteem, bullying prevention, character development, healthy lifestyles, and childhood obesity. Our main focus is to work with community partners in Long Beach to combat bullying through character development and life skills programs for 5th-8th graders and their caregivers that encourage relationship building and respect for self and others. Especially Me! offers an interactive curriculum for girls ages 9-12 with guided discussions on the topics of self-esteem, body awareness, nutrition, bullying, goal setting and decision-making. We celebrated our 12th Annual Kids in the Kitchen, a free healthy eating and exercise fair for the entire family which attracted more than 1,500 attendees. We host free healthy-eating events for youth and community partners throughout the year. Confidence & Me: A Toolkit for Empowering To-Be-Teens is a year round character development and bullying prevention program for 5-8th grade boys and girls and their caregivers, hosted as half-day workshops throughout the city. JLLB is a charter member of the Human Trafficking Task Force in the city of Long Beach, and has published a comprehensive Resource Guide to assist organizations, agencies, and individuals in the greater Long Beach area and Los Angeles County who are aiding survivors of human trafficking. With your help, we can continue shaping the future of our community through the growth and enhancement of our programs. I invite you to be a Pillar of the Community. Included in this packet is information on our programs, the six levels of donor support offered, and the associated courtesies that we extend to our partners. 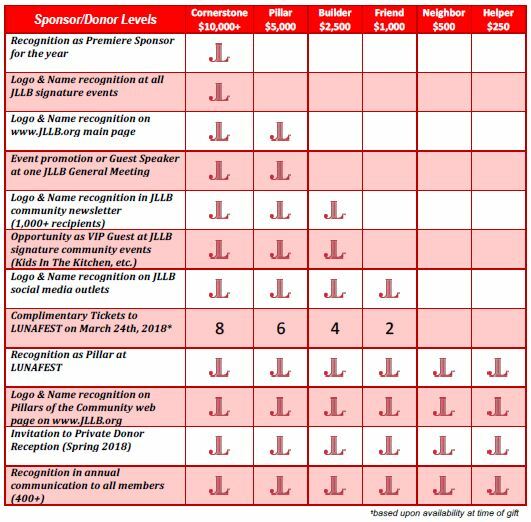 Please see the Pillars of the Community Sponsor Sheet for sponsor levels and associated benefits.